A couple weeks ago, I happened to check my credit card points and noticed we were really close to hitting a reward. Once we got there, I decided to go with a restaurant gift certificate. It’s always nice every now and then to get a meal and not have to pay for it. Our credit card company had a few popular choices, but I went with my favorite chain. T.G.I. 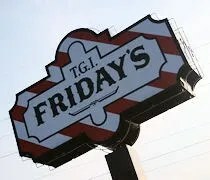 Friday’s is in Oshtemo Township just off US-131 on Main Street. It’s a real hard entrance to find if you’re not familiar with it. There were a couple cars in front of me that both went too far and had to do a U-Turn at the gas station next door. The building sits back off the road. You have to hit what looks like an access road to get to the parking lot. Speaking of parking lot, another weird set up. There are a few spaces in front of the store, but the majority of the parking is behind it. For a pretty popular chain, everything about the location seems odd. It’s a place you can see from the highway, but getting there can be a little rough. We decided to make Friday night date night and we decided to spend that Friday night date night at T.G.I. Friday’s. I had just opened the mail and found the gift certificate and I figured we could get a pretty cheap meal since we don’t normally go over $25 bucks anyway. To my surprise, the restaurant wasn’t packed. Almost every table was full, but there was no wait. It was prime dinner time on a Friday night, but it was a pretty nice night out too. We were taken to a two person both in the front dining room. The table was a little small which would come in to play later in the meal, but it was cozy. The decor is typical of Friday’s with brass railings, Tiffany lamps and antiques. I’ve only been in a few other Friday’s, but they’re all the same. Since we had the gift card, we decided to skip the pop and order some alcohol. I stuck with an Oberon which has quickly become my favorite beer. I can’t even drink the large domestics anymore…don’t know what I’m going to do once the summer is over. J started with the Ultimate Mango Berry Daiquiri. That drink is Bacardi Superior Rum, peach schnapps, mango and strawberry purees, and a house made sour mix with a squeeze of lime. She really liked it, but when it came time for drink #2, she noticed another drink that sounded even better….and she was right. The Fresh Mango Lemonade is a mix of Absolut Vodka, Malibu rum, fresh lemon juice, and agave sour mix that is shaken tableside in a special T.G.I. Fridays shaker then poured over ice. Our server told J that the drink she ordered was the first of this particular drink that the restaurant had sold. There was quite a bit extra in the shaker after he poured the drink, so he left the shaker at the table. She loved it. She’s already talking about going back just to get another one of these. For our meal, we both decided to go with the 3 courses for $12.99. That’s over our $25 before you factor in drinks but we both figured it was something we wouldn’t do without the gift card, so why not. For the appetizers, I chose the Fried Mozzarella. These things were delicious. 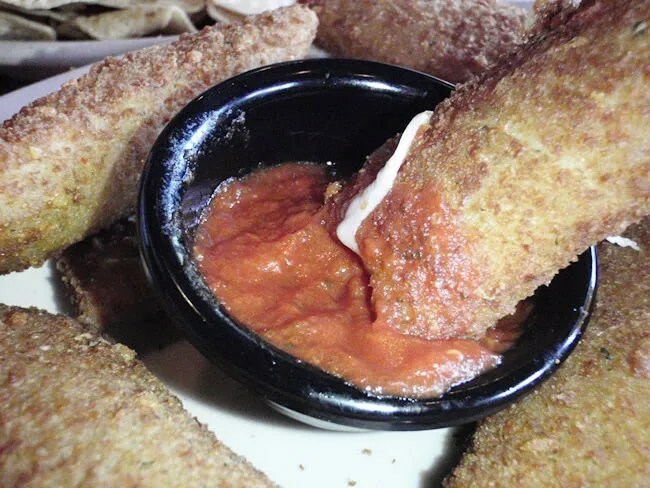 They’re pretty typical mozzarella sticks, but instead of being round, they’re somewhat flattened. The breading stuck to the cheese really well and it is served with a cup of marinara. I was kind of surprised to see it was the full appetizer. It wasn’t paired down because of the 3 for $12.99. There were six sticks which was more than enough for me yet I ate them all. J got the Tuscan Spinach Dip. Again, a full size appetizer with a good amount of chips. 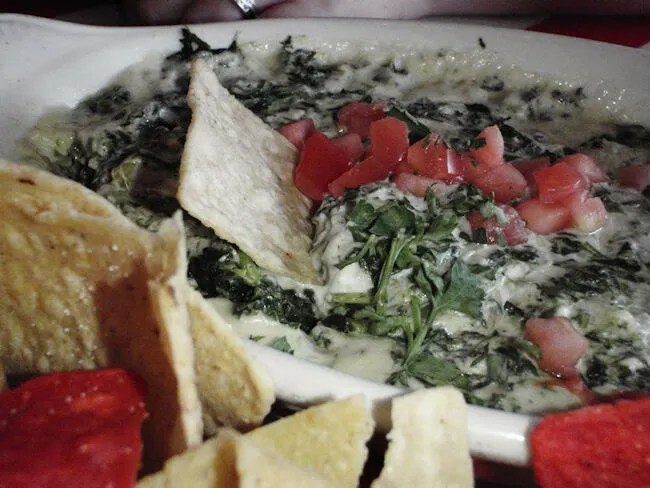 I don’t like spinach dip, so we didn’t really share with each other. She ate about half and asked for a box. She knew there was still a lot of food coming and the dip was something she could easily take home for later. She ate about half before we boxed it up and really liked it. For the entrees, I actually surprised myself and passed on beef. I was going to get the petite sirloin, but instead, I ordered the Sizzling Parmesan Crusted Chicken. It is actually two chicken breasts with a Parmesan crust served on a sizzling platter with melted cheese and fresh bruschetta. 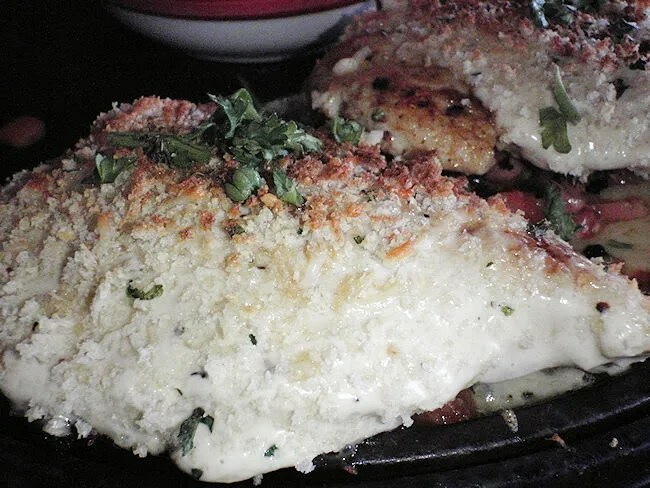 The chicken is basted with a Caesar dressing and crusted with Parmesan cheese. 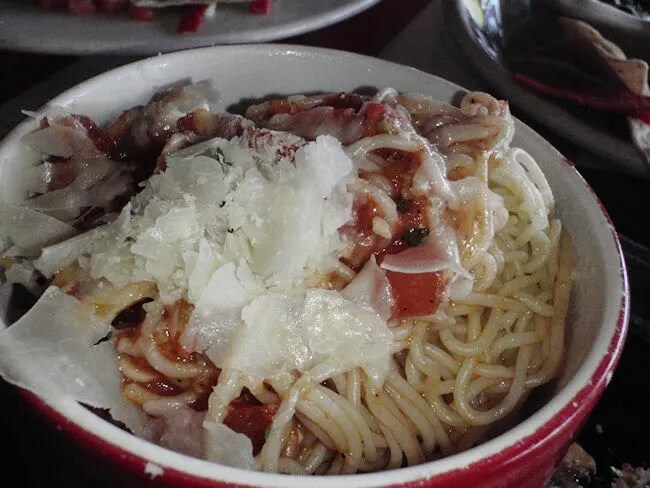 It comes with angel hair pasta dressed with Roma tomato, basil, and garlic marinara. Again, the portion size is huge. I ate one of the sizzling hot chicken breasts and packed the other up for later. The crust was delicious although I wish the cheese that the chicken was resting on was actually served on top. I scraped some of it off the plate just to make my chicken a little more cheesy. The pasta was pretty good as well, but not entirely my thing. I’m not a huge fan of a chunky marinara and that’s how this pasta is served. There are large chunks of tomatoes and garlic. Still is was good and there was enough for me to take home for yet another meal. J got the Santa Fe Chopped Salad. This thing was ridiculous. It could have fed a family of eight. J had no idea how she was even going to eat a quarter of this salad. 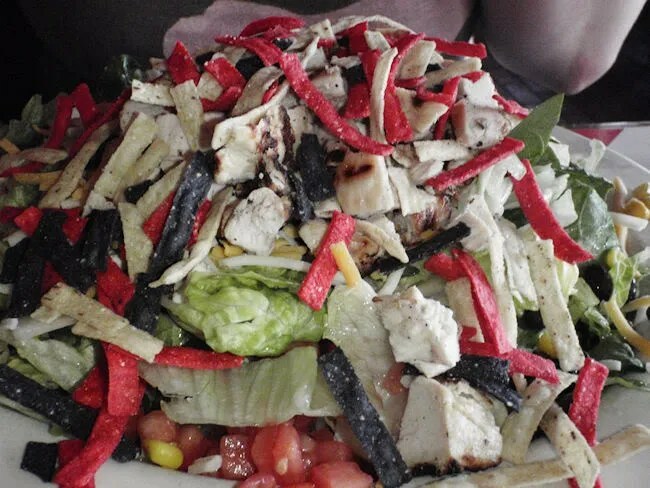 The pile of mixed greens is topped with tomatoes, red onion, cilantro, corn, black beans, tortilla strips, diced chicken, black olives, avocado, and cheese. The dressing is a Chipotle Ranch. I’m not sure if the dressing was tossed in or not, but J couldn’t find it and when she asked, a waitress brought out two little cups of the dressing for her. She really liked the salad, but didn’t even make a dent in it before asking for a box to take that home as well. She really liked the dressing and the tortilla strips. 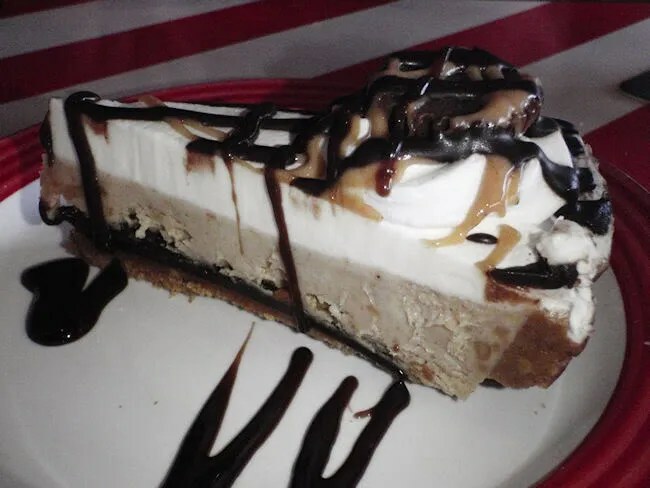 For the final course, you get the option of either a Vanilla Bean Cheesecake or a Chocolate Peanut Butter Pie. We got one of each. I got the cheesecake, J got the pie and we shared a little. I love cheesecake. It’s by far my favorite dessert and this one did not disappoint. Like everything else with our meal, it was bigger than we expected, but there was no cheesecake going to waste. I was going to finish it no matter what. 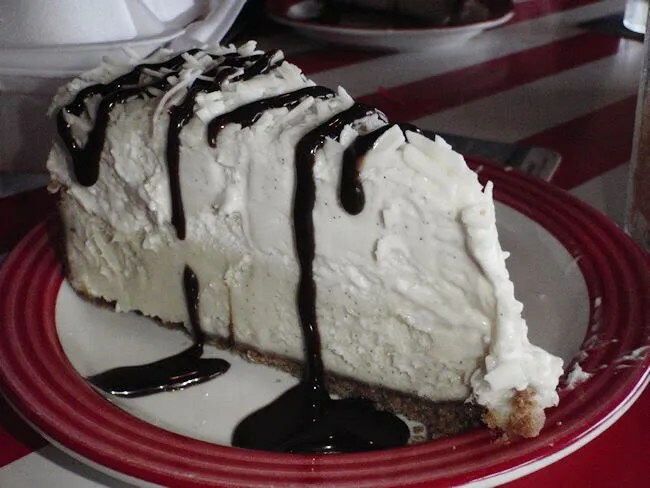 There was quite a bit of whipped cream which I could have done without, but there was also chocolate sauce and white chocolate shavings on top of that whipped cream so I couldn’t just toss it to the side. J’s Chocolate Peanut Butter Pie was also sinfully delicious. She was nice enough to offer me a few bites and it tasted like a creamy, cold peanut butter cup. We were a little surprised when we got our bill for $45, but both of J’s drinks were pretty expensive. After the gift certificate, our portion of the bill was still $20, but we got more than our money’s worth. The portion sizes are ridiculous. We would have been fine had just one of us ordered the 3 courses for $12.99 and split it. Both of us doing it was waaaaay to much food. We walked out of there with two to-go boxes stuffed as full as we could get them. I didn’t want to ask for a third. J and I aren’t really chain people, but T.G.I. Friday’s is one of my favorites. They have a really good menu that changes quite often and they have a good drink menu if that’s your thing. 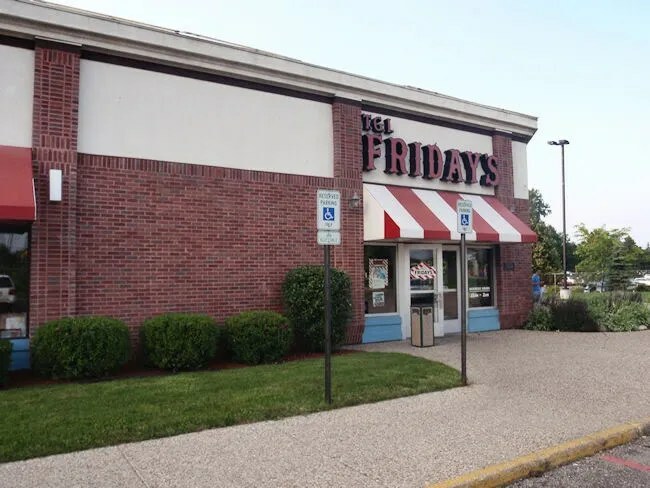 Friday’s is the one national chain that I can go to over and over and never get tired of. Angel Hair Pasta w/Roma-Tomato, Basil and Garlic Marinara.